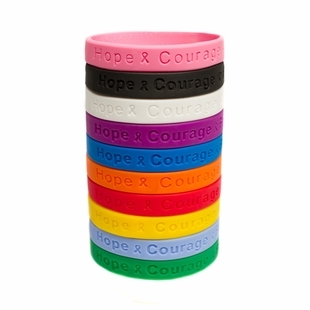 Our "Hope Courage Faith" Rubber Bracelet Wristbands come in fifteen different colors and they are packaged in individual poly bags. Each color expresses your awareness and concern about a different disease or cause. All of our wristbands are made of durable, seamless, 100% silicone rubber. The Adult 8" size is universal fit, the 7" size is for youth or small adult wrists.